Could you do with extra room in your home? Maybe you have a growing family and need an extra bedroom or playroom, maybe you are starting a business and need an office, how about a spare room for guests or an art studio? The reasons are endless. Is your loft space being wasted by storing junk and empty boxes? 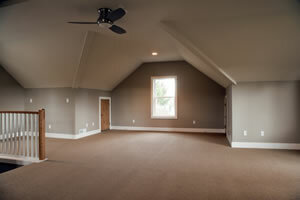 Put your loft to better use by converting it into a habitable room that will add value to your home. Convert your attic space or convert you loft space to an extra room - this is often a very cost effective method to increase your living space, particularly in London where property prices and space are at a premium. It’s certainly less expensive and less hassle than moving home. Converting your loft may not be as expensive as you think. Our prices start at only £27,500 and if you consider the cost of moving these days can easily be anywhere between £20-30,000, thats really very good value. Royle Builders can transform your roof space into a beautiful airy rooms with minimum disruption to your property. We do not even come into your living accommodation until we are ready to fit the staircase. Either create one large room with en suite bathroom, or choose to section the room to incorporate walk in wardrobes. Loft conversions in London start from ONLY £27,500 for a terrace property!! Are you considering turning that wasted space in your loft into extra living space with a loft conversion? Give us a call to discuss your loft conversion project and see how you can add value and space to your property. Stefan and his team worked at our house building a loft conversion with a dormer and totally refurbishing the rest of the house, the front and back gardens. They were reliable, honest and conscientious hard workers. Nothing was too much trouble for them and we would not hesitate to recommend Royle Builders to anyone for any job, big or small. Based in West London, Royle Builders offer a complete building service throughout West London and the home counties. As well as providing general building services, we specialise in loft conversions, garage conversions, outbuildings, extensions, renovations and driveways.